After a heartfelt introduction by actor Joe Manganiello, D&D announced its new adventure in its two-day celebration, the Stream of Annihilation. The new adventure is Tomb of Annihilation. “It’s inspired by some classic adventures,” said designer Chris Perkins. It will be released Sept. 8 in game stores and in wide release Sept. 19. 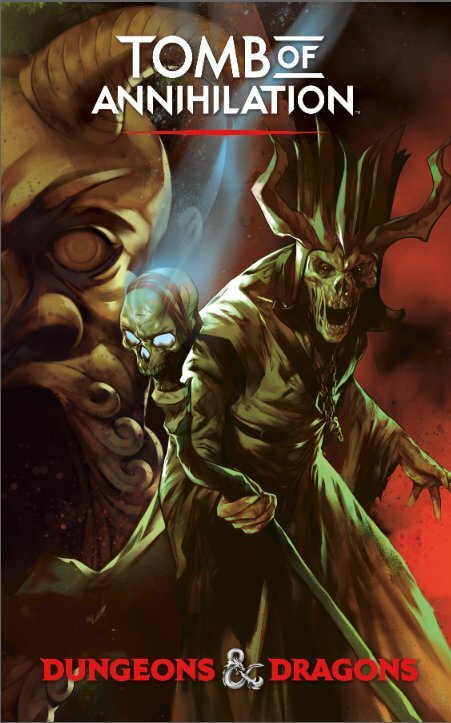 The adventure pits characters against big bad guy Acererak, the baddest lich in all of Dungeons & Dragons who you probably know from Tomb of Horrors. Fans hoping for a trip to Greyhawk or Eberron or wherever may be disappointed. The adventure is set in the Forgotten Realms, like nearly all 5th edition products, but they’re venturing far away from the Sword Coast. The book will have a map of the coasts of Chult, but players will need to explore and fill in the blank areas. Think of it like an Indiana Jones-like expedition into the jungle to discover the lost continent. And encounter monsters like zorbos and froghemoths. Here’s the story: The magic that brings people back to life is failing, so anyone who has benefited from a resurrection spell is having some serious issues. And no surprise: Acererak is to blame. There will also be mechanics to mess with deaths, death saving throws and resurrections, if you so please. “This is far worse than any dungeon we’ve created for you,” D&D’s Mike Mearls said on the stream. Pendleton Ward from Adventure Time worked with Perkins on the book’s story. If you tune into the stream, you can see people play parts of the book. Pre-order Tomb of Annihilation now from Amazon. Having Tomb of Horrors as a part of Tales From the Yawning Portal was fun, but I really like how they’re looking at a much-expanded meat-grinding tomb. And I’ve also never played a D&D game that involved this kind of exploration. It sounds like a blast from both a DM and player perspective. And as for it being set in the Forgotten Realms, whatever. I don’t care. Anyone who’s paying attention can see that Wizards is pretty set on keeping things there, and that’s fine by me. If you’re dead set on running something in in another world, go ahead. You can convert any number of old adventures to 5e pretty easily, and you can easily drop this adventure (especially this one) into any world you please. I’m most interested in the storyline: Why is Acererak no longer in the Tomb of Horrors? What has he done to the magic in Forgotten Realms? What happens to death and resurrections in the Realms?